Childhood days are the ones that are the happiest. It has memorable moments and priceless memories. The entire day can pass by without any idea of what time it is. Whether it is playing outdoors, indoors or just hanging out with each other, it is amazing all the time. Riding a bike around the neighborhood with your friends is a great activity. It is fun, exciting and you always have a good time. But what if you are bored of just riding a bike? What if you want some more excitement? Now you can easily convert your bike into an electric powered scooter or moped. Why should you convert your bike into a scooter? Riding an electric scooter is more fun than riding a bike. You need not spend a lot of money on a new scooter if you reinvent your old bike. The process of converting your bike to a scooter is a great do it yourself activity and it does not take a very long time. It is a great option to ride a moped since it is not only environment friendly but also you need not worry about gas prices. There are a lot of options where conversion kits are concerned. You can buy one and then use your imagination to get the perfect scooter made for yourself. The AW Electric Bicycle Motor Kit includes the whole wheel with the tire. This kit includes a motor controller, motorized wheel, thumb throttle, power brake lever and wire harness. The motor is a powerful 36V 250-watt brushless gearless hub motor, which is quiet and reliable. A thumb throttle is provided with 3 LED indicator lights. The driving system is gearless and no chains that move, so it will not break easily. The brake shuts off the motor automatically and hence it is very safe. This AW Electric Bicycle Motor Kit comes with a 600D Oxford cloth-carrying bag, which is durable as well as helps to carry the battery. One of the drawbacks of this kit is that it does not include the battery or the charger. These would have to be purchased separately. Some of the buyers have said that this product was a little difficult to assemble. This kit comes with a 250-watt motor. Due to this, it may have less power compared to some of the other motors in the market such as a 500-watt or 1000-watt motor. Most of the people who have purchased this product have been impressed with the packaging first. They say that the kit was packed well and the packaging was of very good quality. Another good thing is that the item’s packaging will indicate what the contents are and nothing will be hidden. 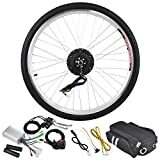 The AW Electric Bicycle Motor Kit comes with the whole wheel with tire and not just the tire frame, unlike some other kits. The dimensions of the whole front wheel with tire are 26 inches x 1.75 inches. Since the motor that comes with this kit is small and lightweight, it will save more power than a large motor at the same speed. This makes it very efficient. Also the drive system does not have any moving gears or chains. Hence there is no friction and less chance to break. This increases its efficiency as well. One of the most important features of this kit is that it has a dual mode controller. In some other kits with 1 model controller, the motor works only under Hall effect. In case the hall components inside the motor break down, the motor stops working. In the case of the AW Electric Bicycle Motor Kit, if the components of the controller break down, it switches to non-Hall effect mode. This ensures that the motor will still be working. Thus, since the motor works under Hall effect and non-Hall effect, it extends the life of the motor for the electric bike. There are many kinds of kits available today and at different prices. The AW Electric Bicycle Motor Kit at this price is absolutely worth the money. It would be a great idea to buy this kit especially if you are starting out and are unsure about converting your bike. It maybe one of the cheapest electric bike conversion kit but it is certainly worth the money. Gas powered vehicles require maintenance and a considerable amount of money is spent on gas. You also need to have a license, get the vehicle registered, get the insurance and all the other fees add up to a significant amount. The electric bike is a great mode of alternate transportation. It is fun and with a great motor, travelling is also quick. They are easy to operate and very economical. You do not need to worry about license, registration and insurance in most places. Also the maintenance charges are minimum. If you have an old bike, lying around in your garage, and you have been planning to discard it, you need to rethink. It is the perfect opportunity to buy an electric bike conversion kit and reinvent your old bike. The AW Electric Bicycle Motor Kit would be the perfect start to your mission. With its reasonable price and amazing features, the conversion process would be a fun do it yourself project. Buying an electric bike conversion kit also gives great flexibility over a factory built electric bike model. You can customize it as per your preference and taste and use the kit with just about any bike. It comes with a whole front wheel with tire, not just the frame of the tire. The biggest advantage of an electric bike conversion kit front wheel is that is easy to install. The front hub motor also helps to equalize the weight of the bicycle since the batteries are usually mounted at the back. The AW Electric Bicycle Motor Kit has a 36V 250-watt brushless gearless hub motor, which is quiet and reliable. Since the motor is brushless, it comes with almost no limit on its life, as there is no contact between any of the parts inside it. Another important feature is that the motor of this electric bike conversion kit works under the Hall effect and non-Hall effect. In motors with 1 mode controller, the motor works only under Hall effect. It stops working if the internal components break down. In the dual mode, the controller will switch into non-Hall made if the components break down. Thus the motor will still be working. You will not need to worry about the safety and efficiency aspect when it comes to this best e bike conversion kit. The drive system does not have any moving chains or gears, which can cause friction or lead to breaking. It is also safe to ride as the brake shuts off the motor automatically and also saves energy. 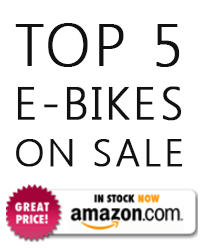 Being a complete value for money ebike conversion kit Amazon has really been able to bring out its great features due to its online listing. Its reasonable pricing and easy to use model has earned it high ratings and great reviews on most major websites. This AW Electric Bicycle Motor Kit is a great way to revive your old bike. Buy this conversion kit and add a fresh coat of paint to your old bike to reinvent it. It would be a far cheaper and better option than buying a factory e-bike model. You would not only own your very own customized electric bike but the satisfaction of putting it together yourself would be priceless! 0.1 Why should you convert your bike into a scooter?